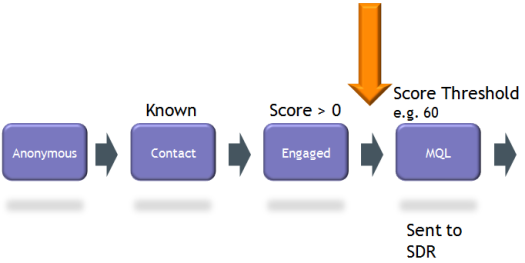 Once you set-up lead scoring, how do you ensure that it’s working correctly? One of the big benefits of lead scoring is the ability to identify the best Marketing Qualified Leads (MQL) based on lead score. Even though scoring is turned on, it may not be sending MQL to Sales right away. If this is the case, ask yourself- am I using lead scores to identify these leads that have proven themselves as marketing qualified? The orange arrow below shows an example threshold of where leads become MQL. In this case, Engaged (the last status before handoff to Sales) leads become Marketing Qualified based on a lead score of 60. These MQLs then get passed to our SDR (Sales Development Reps aka. Inside Sales Team). Sort the list by lead score, look at the field values and activity of high-scoring leads, and decide whether or not you want these leads to be MQL. If you find categories of leads that should not be considered qualified for sales (i.e. partners), simply filter those out of your list. After refining the filtering, you should get to a list of leads that have high scores, that you would’ve wanted to send to sales. Up to this point you were looking at all leads with a high score regardless of when or how they achieved this score. Look at the leads that recently hit the score threshold, those proven as MQL. With implementing a score threshold, leads immediately pass to Sales when they reach that magic number. Marketo’s magic number is around 60, and we vary this to control the flow of leads to our Inside Sales Team. Now, get with your Sales Team and look above and below the threshold to see what score Sales wants a lead to reach in order to become a MQL. This will allow you to set and confirm your score threshold. Is Sales happy with the MQL that are passed to them? If not, possible causes could be that you are not scoring a broad enough set of activities, the threshold is too low, your scoring point values are off, or you may need to depreciate scores over time. Do scoring point values need to be changed? If Sales complains that your MQLs are not qualified enough, review your scoring rules to filter out the unqualified leads. Does the threshold need to be changed?You can raise the threshold to increase quality and send fewer leads to Sales, or lower the threshold to send more leads to Sales, with lower quality. Later you can get more complex and fancy, but this basic process will help you get your lead scoring working for you!